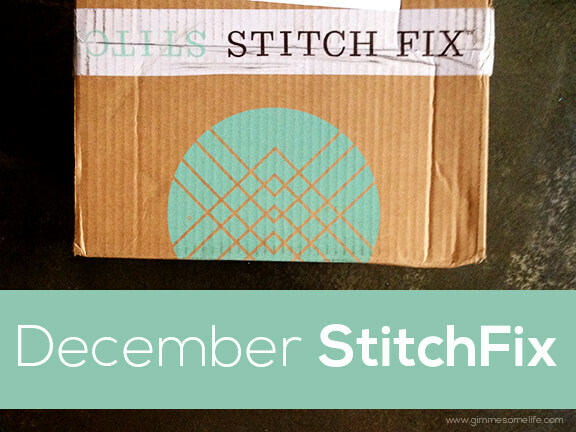 Time for another Stitch Fix review! Man, this is now my fourth month with Stitch Fix, and I feel like the fixes are starting to come quickly! I mean, don’t get me wrong — it’s totally fun to have those little teal boxes with brand new clothes show up on my doorstep. But I also don’t really need many more clothes, you know? Hmmm, I’m considering some changes for 2014. But for now, this month’s fix was actually a bit of a flop. I ended up only keeping one piece that I purchased with referral credits. But as you’ll read below, I was even on the fence about that one. The other pieces were all definite no’s for one reason or another. Bummer, because I really liked a few of them. Regardless, here are the photos. Would love to hear from others about how your Stitch Fix experience has been so far! Wait – just what is Stitch Fix? For those of you wondering what Stitch Fix is all about, be sure to hop back to read My First Stitch Fix post where I share all of the details. Basically, it is an online personal styling service where they mail you a package of 5 surprise apparel items each month, and you decide what you want to keep or mail back. There is a $20 styling fee per “fix”, but if you choose to keep any of the items, that fee is waived. And if you decide to keep all five items, you get 25% off — which is what happened for me this time. 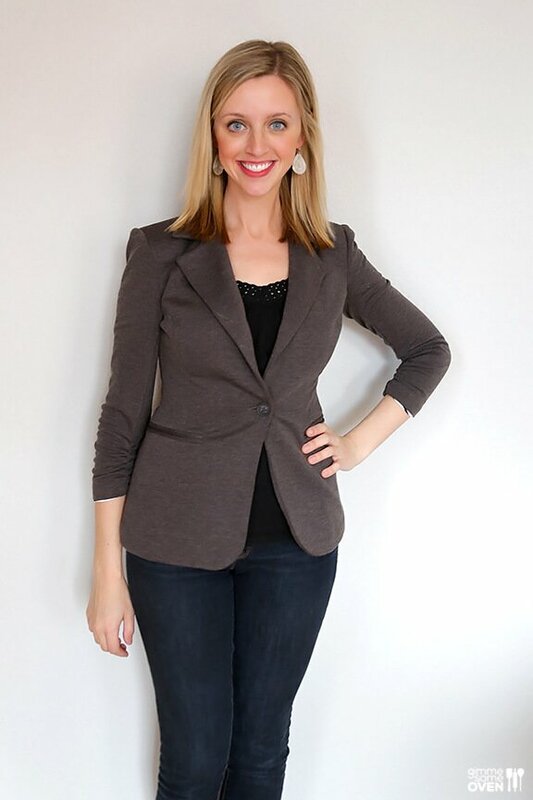 This cute blazer was actually my favorite piece in the fix. It was really well made, super comfortable and stretchy, and it was lined with this really cute white and black print. But it was too small. Close, but definitely not quite. So I emailed Stitch Fix to see if it would be possible to order it in a different size (I had heard this was possible? ), and unfortunately they said no. Bummer! I also forgot to take a picture of just the earrings, but you can sort of see them in this one. They were cute, but actually really heavy. I also already have a pair somewhat in that shape, so I decided to pass. I was also really excited about this dress when I pulled it out of the box. LOVE the red, loved the design, loved how it seemed like a great piece you could dress up or down. But alas, this one didn’t seem to fit right either. It all felt just a little baggy and didn’t lay quite right. Plus, there was way too much gaping for me — the top was held together with only a tiny snap, and the rest of the dress was a true wrap dress and basically (aside from this photo) never stayed closed before the waist. Not quite sure how they expected that design to be functional in public?! Now this dress, on the other hand, was the one that I pulled out of the bag and immediately thought I would pass on…and then decided to keep it. I was annoyed initially because — again — it is literally 9 degrees in Kansas City right now, and Stitch Fix mailed a sleeveless chiffon summer-colored dress. (Flashbacks to my October Stitch Fix review.) Yes, I could layer it with a million things, and may try, but this dress to me screams summer. Finally, there was this other blue dress. I really wanted to love this one — the color was beautiful, and the design seemed like one that would be fun to layer and wear year round. But it did not quite fit. I got it to look somewhat decent for this photo, but the top was way too baggy and the waistline didn’t seem to hit in the right spot. Plus, the fabric was super thin — like, show-every-seam-line-and-probably-tear-a-hole-the-first-day thin. And $88?? Too much. So I sadly passed. Disclaimer: Just to be clear, this is not a sponsored post. I am not being paid by Stitch Fix to promote their service. I just happen to like it and thought it would be fun to share! I do receive a referral credit if someone signs up through any of the affiliate links on this page. Ali, I totally understand how you felt about the dresses. They’re beautiful but don’t seem to be fitting you right … yet I still want to love them! I just got my first stitchfix and had some issues with fit as well. I heard that over time the fit and style tends to improve which I hope is the case! I got that same blazer in a different color and it was also too small on me. I guess they sized it badly. I also got the 41 sleeveless dress (in a different color with stripes at the bottom) in my November fix and I live in St. Louis. I was disappointed about it! I love, love, love the color of yours!